Stainless steel case with a black rubber strap. Stainless steel bezel. Silver dial with silver-tone hands and index hour markers. Minute markers around the outer rim. Luminescent hands and markers. Date display appears at the 3 o'clock position. Quartz movement. Scratch resistant sapphire crystal. Screw down crown. Solid case back. Case diameter: 39 mm. fold over clasp. Water resistant at 300 meters / 1000 feet. Functions: hours, minutes, seconds, calendar. 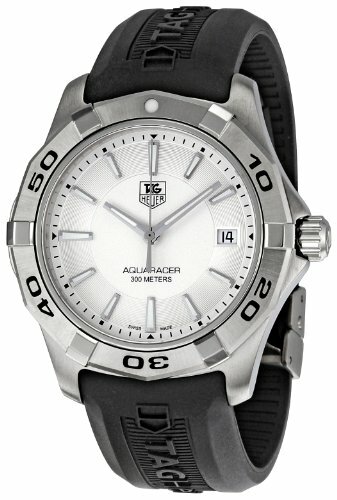 Tag Heuer Aquaracer Silver Dial Black Rubber Strap Men's Watch WAP1111.FT6029. Stainless steel case with a stainless steel bracelet. Uni-directional rotating stainless steel bezel. Silver opalin dial with silver-tone hands and index hour markers. Minute markers around the outer rim. Dial Type: Analog. Luminescent hands and markers. Date display at the 6 o'clock position. Two sub-dials displaying: 60 second and 1/10th seconds. Quartz movement. Scratch resistant sapphire crystal. Solid case back. Case diameter: 40.5 mm. Round case shape. Deployment clasp. Water resistant at 300 meters / 330 feet. Functions: chronograph, date, hour, minute, second. Dress watch style. Watch label: Swiss Made. 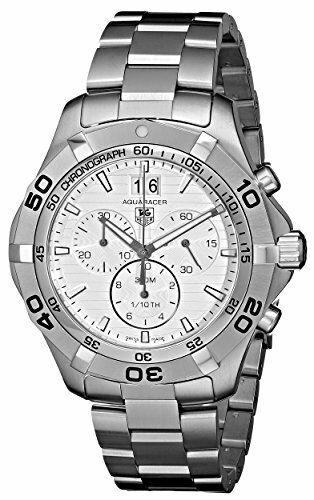 Tag Heuer Aquaracer Silver Opalin Dial Stainless Steel Chronograph Mens Watch WAY111Y.BA0928. Steel case with a steel bracelet. Fixed steel bezel. Silver guilloche dial with luminous hands and stick hour markers. Minute markers around the outer rim. Luminescent hands and markers. Date displays at the 3 o'clock position. Automatic movement. Scratch resistant sapphire crystal. Screw down crown. Screw down case back. Case diameter: 41 mm. Fold over clasp with double push button. Water resistant at 300 meters/1000 feet. Functions: hours, minutes, seconds, date. 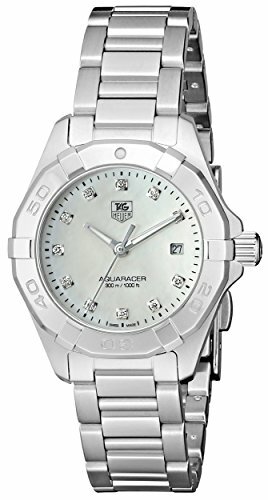 Tag Heuer Aquaracer Automatic Men's Watch WAP2011.BA0830. Since the 1860s, Edouard Heuer and the company that he founded have been responsible for some remarkable watch making achievements. Heuer introduced the 1/10th second time measurement and the flyback mechanism. The firm has had strong affiliations with the Olympic Games, Formula 1 racing, and numerous sporting personalities. 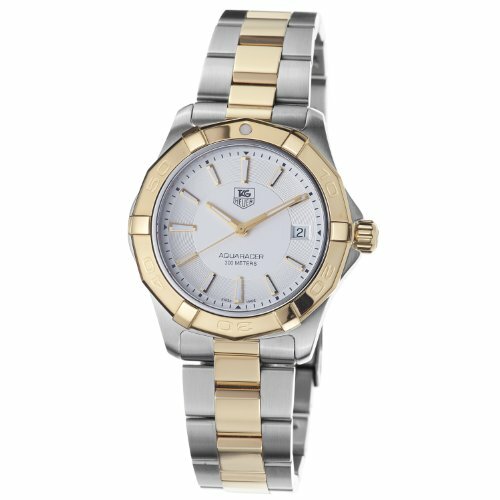 TAG-Heuer's current watch collection boasts stylish sporting designs that feature advanced quartz and mechanical movements. 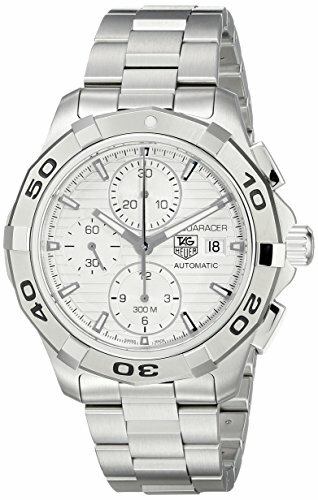 Stainless Steel Case and bracelet, Double locking fold over clasp, Unidirectional rotating bezel, screw down crown, Silver dial, Chronograph feature (minutes, seconds, and 1/10 second), Small second subdial at the 3 o'clock, Double date window at the 12 o'clock position, Luminescent hands & markers, Scratch resistant sapphire crystal, Swiss Quartz movement, Water resistant 300 meters/ 1000 feet. Introducing the Tag Heuer Aquaracer Automatic collection. Stainless steel case measures 43mm diameter by 15mm thick. Brushed and polished link bracelet includes a convenient push button deployment clasp. 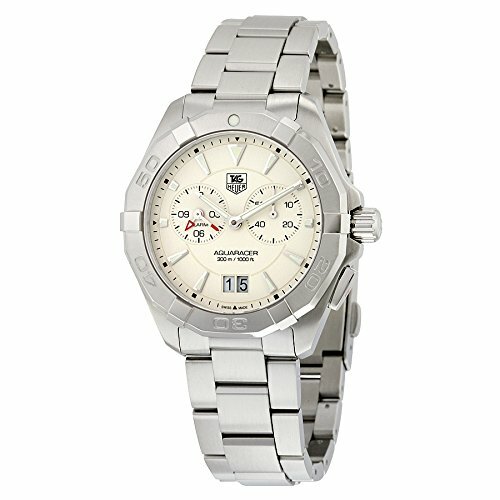 Stylish silver dial has luminous hands and hour markers. Date display feature at the third hour. Watch boast a chronograph. Designed and made for precision time keeping Swiss Automatic movement. Crafted scratch resistant sapphire crystal. Water resistant up to 300m. Features a screw-down crown for maximum water protection. 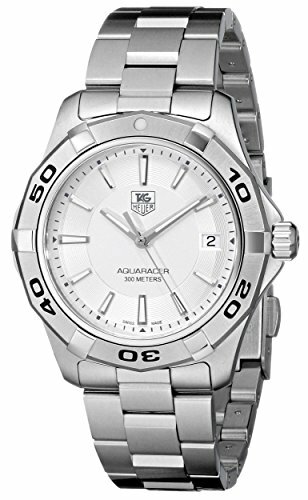 The TAG Heuer Men's Aquaracer 2000 Automatic Men's Watch #WAF2011.BA0818 is perfect for the aquatics lover who wants to keep his classic and stylish timepiece on his wrist whether he's in or out of the water. The elegant, two-tone stainless steel bracelet is complemented by a brushed silver stainless steel bezel with shiny silver-tone accents and black Arabic numbers marking 10 minute increments. The watch's silver dial features shiny silver-tone stick indexes in the number positions and there is a day and date calendar window at three o'clock. The dial has silver-tone hands and a sweeping seconds hand. It is water resistant to an astonishing 990 feet. Stainless steel case, Silver lined dial, fold over clasp with double push button, Screw Down Crown, Luminous Hands, Date at the 3 o'clock position, Uni-directional rotating bezel, Antireflective-sapphire crystal, Swiss automatic movement, Water resistant to 300 meters/ 1000 feet. 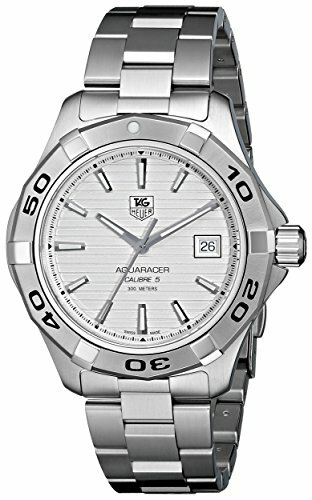 Looking for more Aquaracer Silver Dial similar ideas? Try to explore these searches: Aura Cacia Natural, Armor Footwear, and 3 Point Sling m16. 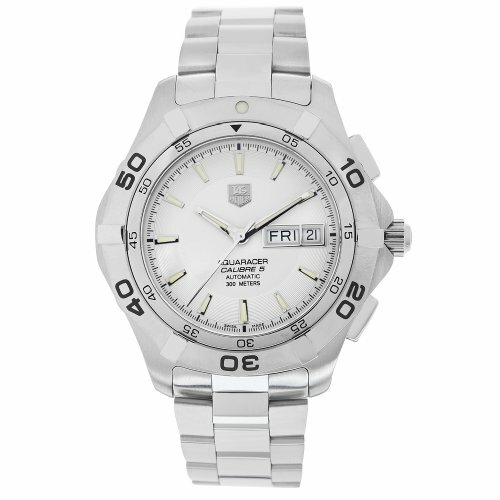 Shopwion.com is the smartest way for comparison shopping: compare prices from most trusted leading online stores for best Aquaracer Silver Dial, Mens Wool Zip, Freestone Stockingfoot Waders, Silver Aquaracer Dial . 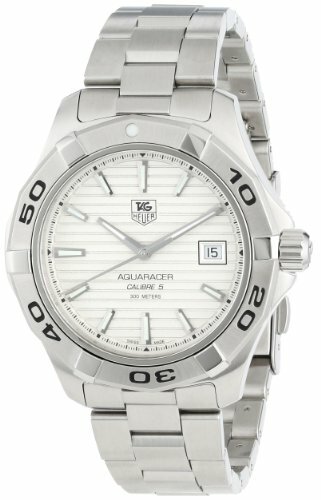 Don't miss this Aquaracer Silver Dial today, April 23, 2019 deals, updated daily.